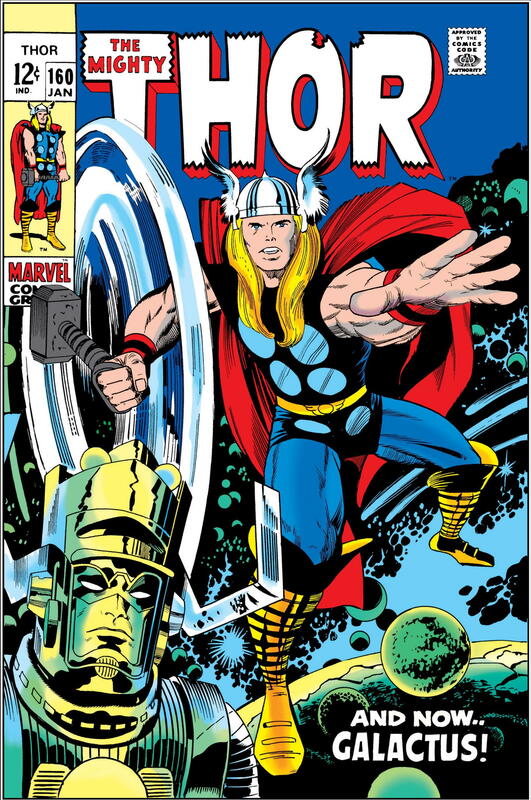 Although the mythological aspects of Thor held rather more appeal for me than either the hero’s battles against Earthbound super-villains or his outer space adventures (not that I ever disliked any of that stuff, mind you), I don’t think I was fazed by the obviously science-fictional orientation of issue #161’s cover. In fact, I was probably interested in seeing the world-devouring Galactus in a new story, having only read about him thus far in Silver Surfer #1, where he’d appeared only in flashback. 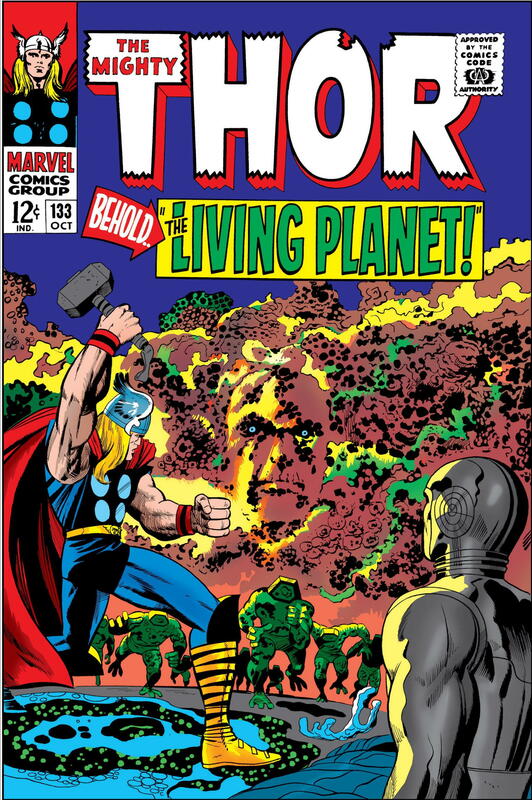 On the other hand, I didn’t know anything at all about Ego, the Living Planet, but I suspect my eleven-year-old self thought he looked pretty interesting on that striking Jack Kirby – Vince Colletta cover. 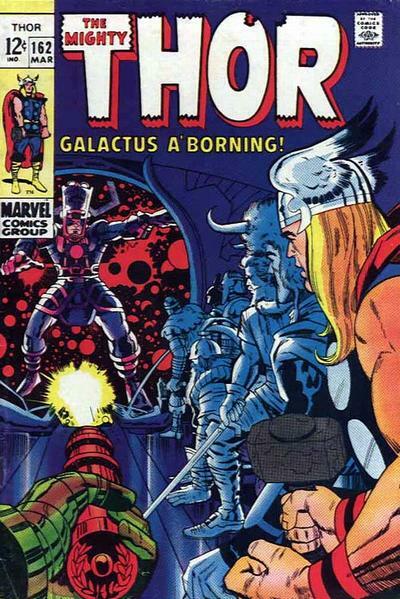 Of course, neither of those cosmic titans were actually named on the cover, and I might not have recognized Galactus just from his profile; but since I’d read the issue descriptions in both this and the last month’s Marvel Bullpen Bulletins, I knew who Thor was going to be meeting, and presumably fighting, here. That’s right, I said this and the last month’s, because #161’s “Shall a God Prevail?” was in fact the second part of a continued story that had begun in the previous issue. By December, 1968, however, I’d jumped in in the middle of enough continued stories at Marvel to trust the publisher’s storytellers — here, Stan Lee and Jack Kirby — to catch me up well enough that I could follow the proceedings with little, if any, confusion. And, as I think you’ll see, they did a pretty good job of that this time, too. 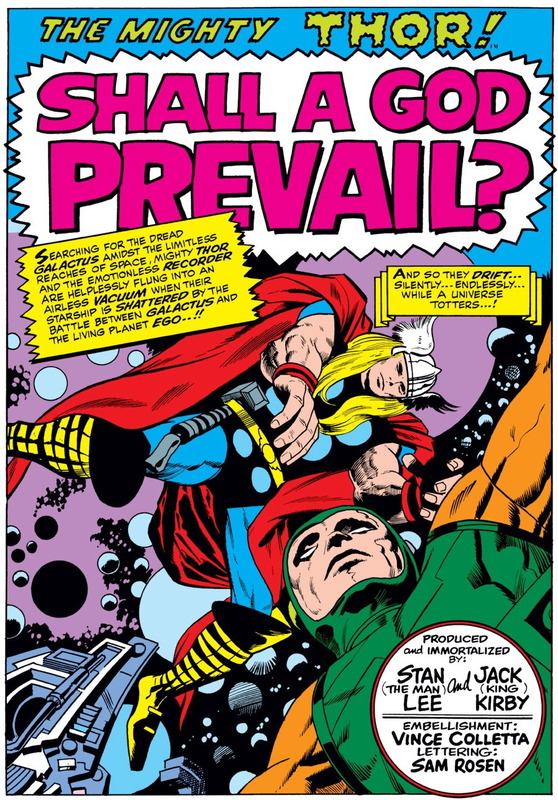 But — since providing historical context is part of the fun of what we do here at “Attack of the 50 Year Old Comic Books” (it is for me, anyway), let’s go ahead and take a look at what veteran Thor readers would have known before turning to #161’s splash page — which means looking not only at the immediately preceding issue (#160’s “And Now… Galactus!”), but also at an earlier storyline that set up most of the major players and situations featured in this one. Way back in Thor #129 (June, 1966), Lee and Kirby had introduced a new character, Tana Nile, as a roommate for Thor’s then-girlfriend Jane Foster. The mysterious Ms. Nile was ultimately revealed to be a space alien, a member of the Colonizers of Rigel, who intended to add the Earth to their interplanetary empire. 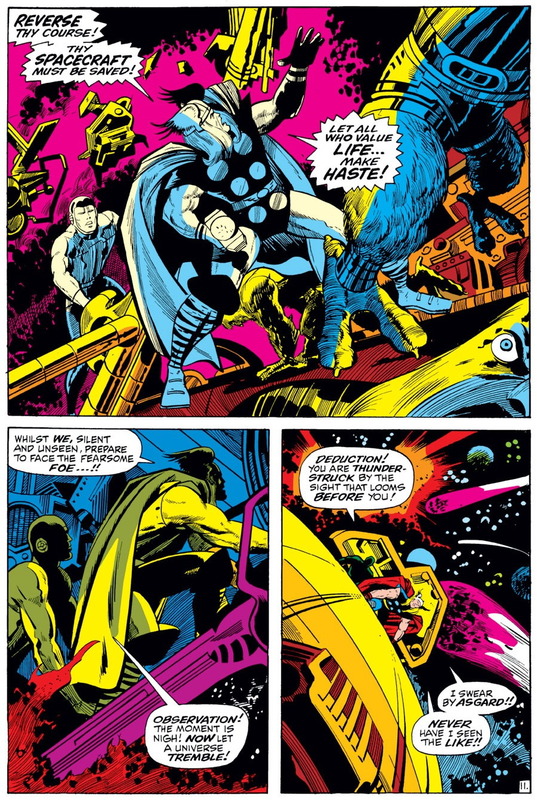 Disputing the Colonizers’ claim, Thor traveled to Rigel to fight them in issue #131, — but soon after his arrival, the Rigellians told him of a greater threat presently emerging in the Black Galaxy. 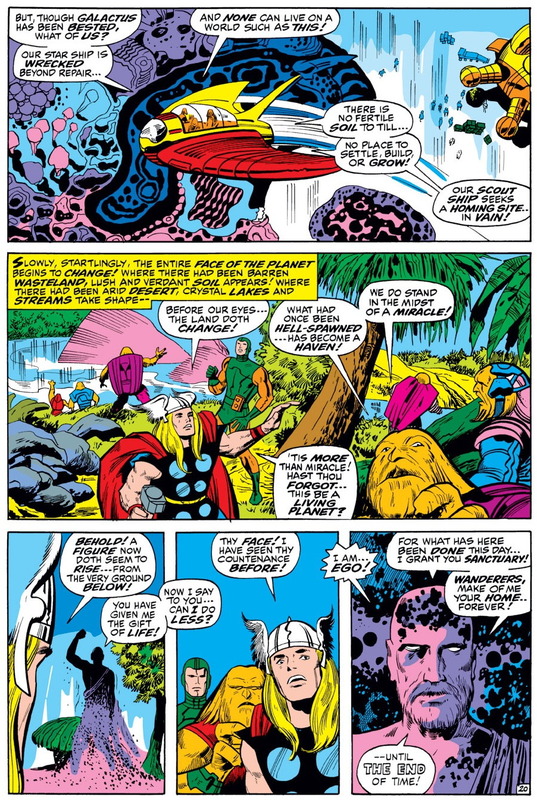 They offered Thor a deal, promising to release the Earth if he’d travel into this unknown realm and neutralize the growing menace, and in issue #132, the God of Thunder agreed. He headed into the Black Galaxy, accompanied by the Recorder — a humanoid robot designed by the Rigellians merely to observe and keep a record of events, but who would in fact soon prove himself an unexpectedly faithful and valiant ally to our Asgardian hero. 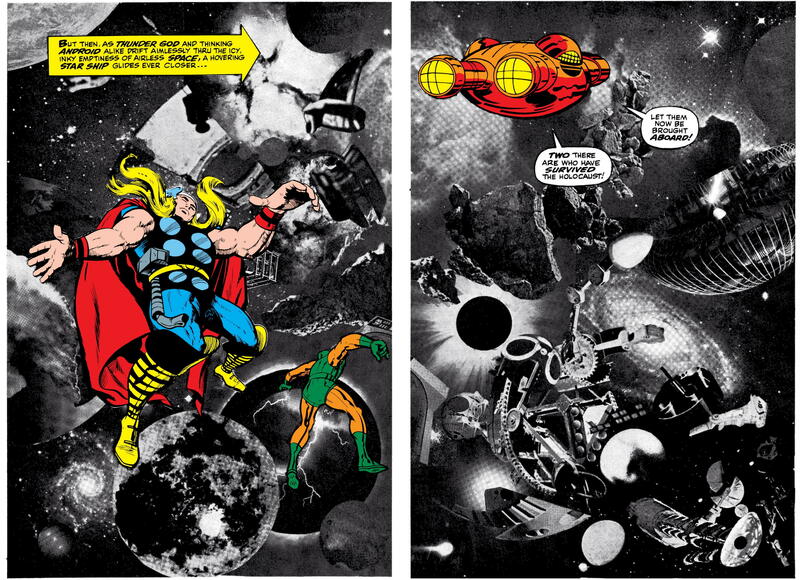 In #133, Thor and the Recorder encountered Ego, the Living Planet — an entire world with a living consciousness, who planned to conquer the cosmos by seeding it with copies of himself. (If you’ve seen the film Guardians of the Galaxy Vol. 2, that plan probably sounds rather familiar.) Thor was ultimately able to triumph over the “bioverse” by using his godly power to summon a super-storm strong enough to wound Ego. Ego promised to abandon his plans of conquest, and Thor and his robot companion returned to Rigel. 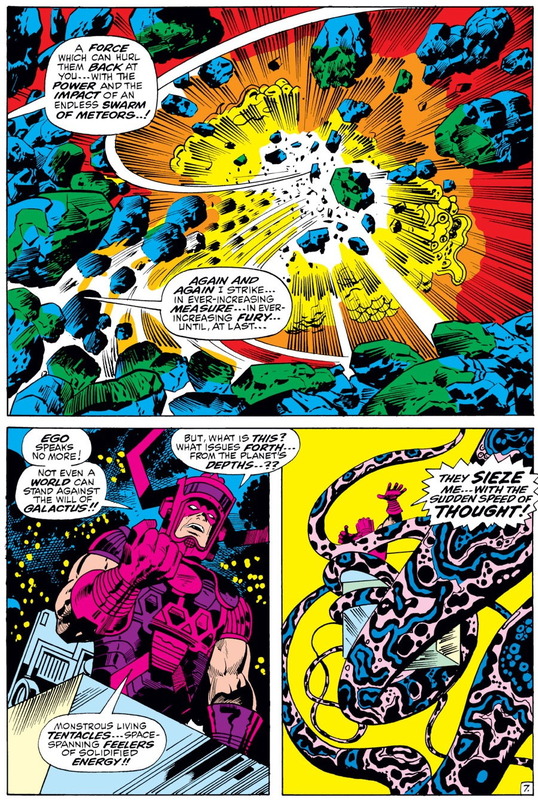 It’s difficult to know whether Lee and Kirby actually intended this scene to set up a future storyline in which Galactus and Ego would battle each other, or if it was simply more of an ironic coda to Ego’s saga: the Living Planet renounces his evil ways, promising to become a good galactic citizen, but then Galactus comes along and eats him anyway. 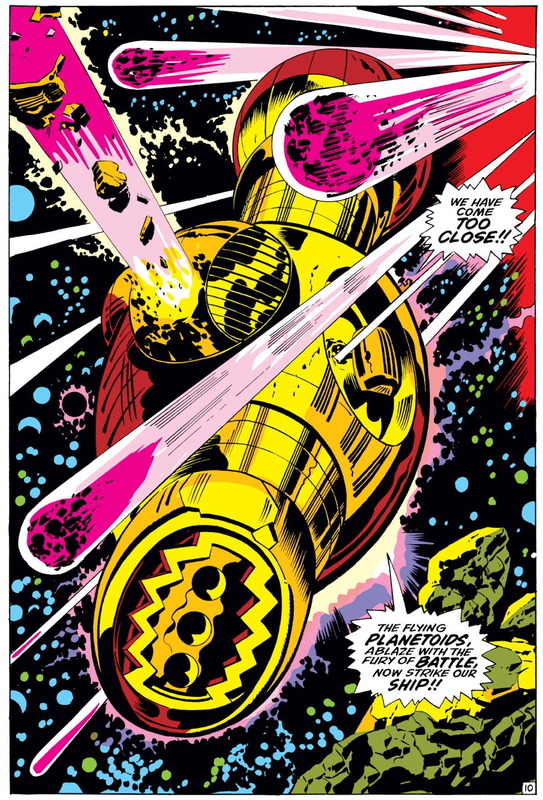 Regardless of the creators’ objective, however, this interior splash page must have thrilled the original readers of this comic in the fall of 1966, representing as it did the first appearance of the Big G since the conclusion of his debut storyline, the vaunted “Galactus Trilogy”, in Fantastic Four #50 (May, 1966) earlier that year. If Lee and Kirby did initially intend for Galactus’ next full appearance to involve Ego, things ultimately didn’t work out that way. The Devourer of Worlds first made a return visit to Earth in a four-part FF storyline that ran from issues #74 through #77, just prior to the release of Silver Surfer #1. 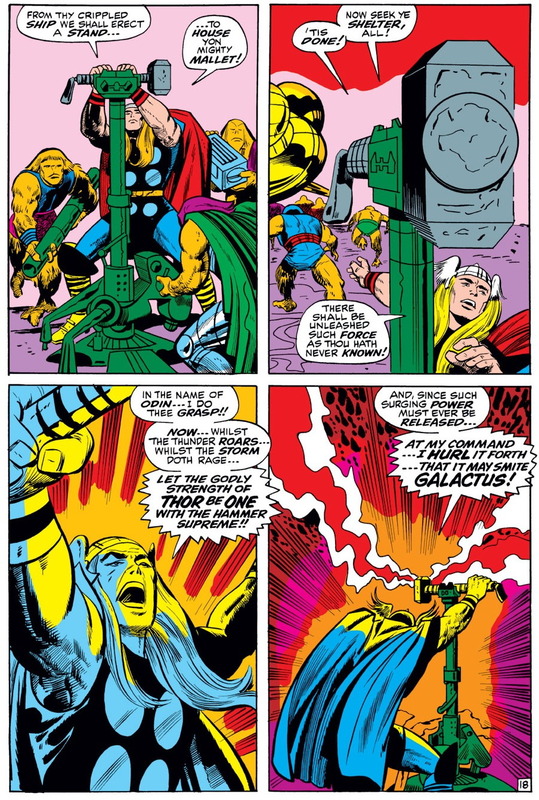 Then, just a few months later, Lee and Kirby finally returned to pick up and follow that dangling plot thread from Thor #134, in the pages of #160. 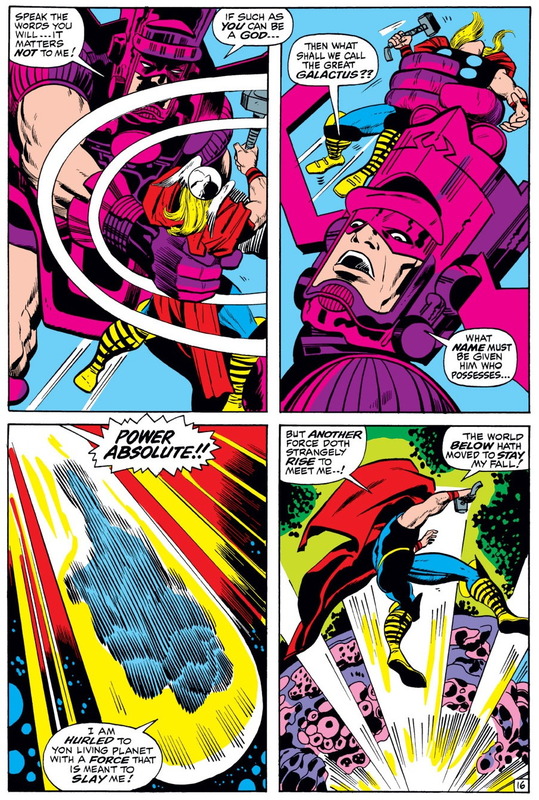 In “And Now… Galactus!”, Tana Nile returned to Earth — this time, not as a would-be conqueror, but rather as a supplicant for the Thunder God’s aid against Galactus — whom she describes as a “Danger which… if it is not checked… can cause the universe itself to crumble!” Thor readily agreed to help, and accompanied the Rigellian into outer space — where the combined sight of ruins of multiple worlds destroyed by Galactus, and a fleet of ships carrying fleeing survivors, only strengthened his resolve. It’s interesting to revisit this page from the perspective of 2018, and be thereby reminded how, in the first few years following the creation of Galactus, the character was portrayed as being such a danger to the universe that — even allowing for the fact that he acted from existential necessity (hunger) rather than malice or greed — a Marvel hero like Thor simply couldn’t permit him to continue to go on as he was. 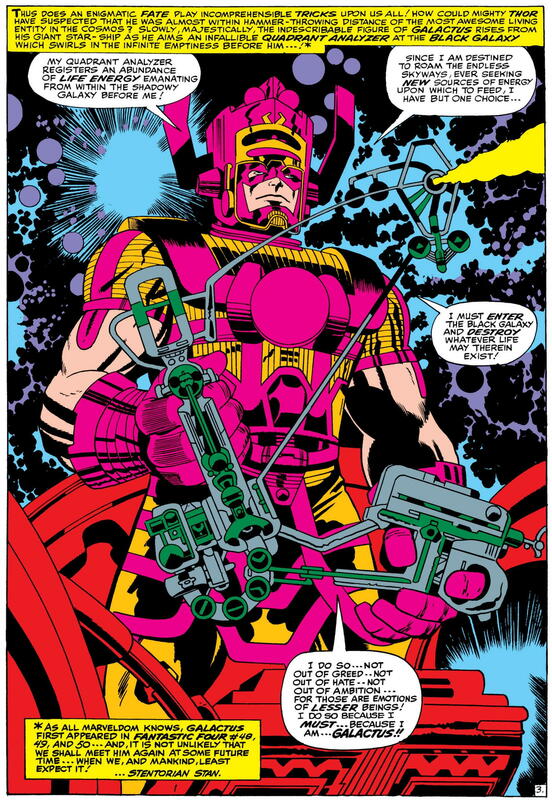 Marvel has presented Galactus for so long now as a regrettable but necessary fact of life in the Marvel Universe — part of the cosmic order of things, to be left alone except (maybe) when he attacks our own planet — that it’s somewhat startling to encounter a story wherein his very existence is perceived as being a universal crisis. 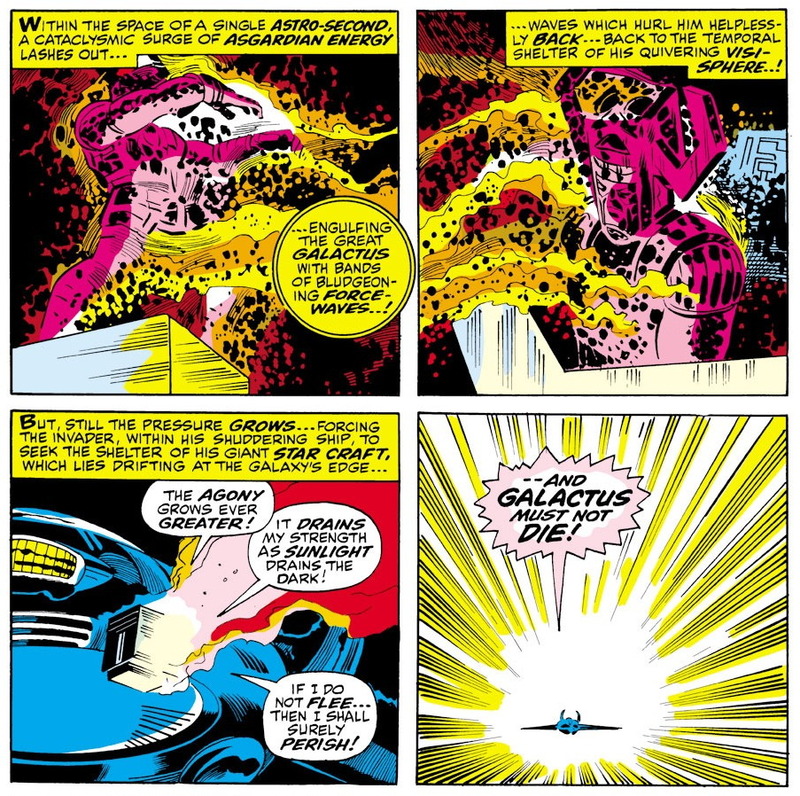 Following this sequence, readers were shown that back in 1966, Ego had apparently managed to somehow hide himself, or to otherwise misdirect the awesome planet-killer, as Galactus was shown here to once again detect the presence of a “dim but probing area of vast intelligence“, which of course was ultimately shown to be Ego, the (still) Living Planet. Ego struck first, assaulting Galactus with energy bolts, which Galactus followed to their source — and then retaliated for the bio-verse’s attack, striking back “with the fire of a thousand suns!” In the meantime, Thor and Tana Nile had reached Rigel, where the Son of Odin was reunited with the Recorder (who’d actually been hanging out in Asgard for the last few months, having been sent there to record what was supposed to be Ragnarok but actually wasn’t, in issues #155 – 157. Small universe, huh?) 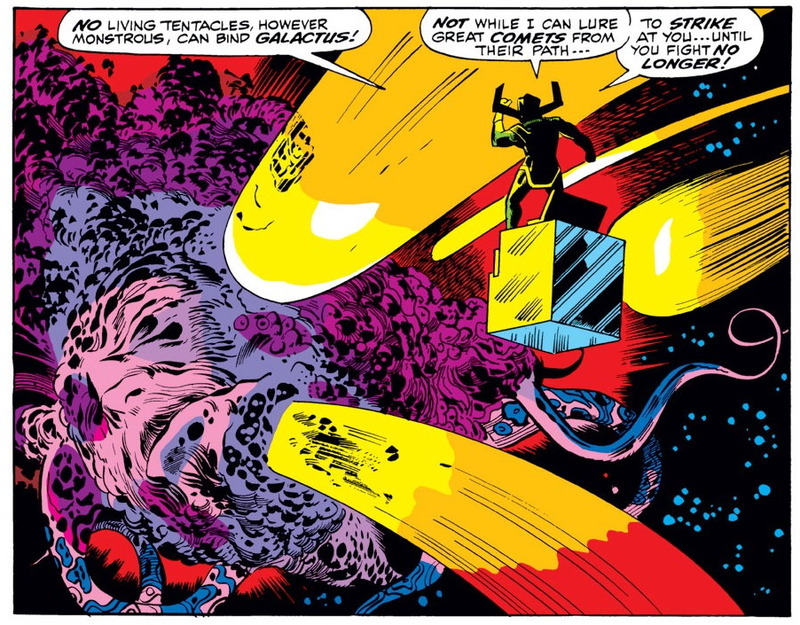 The two companions boarded a spacecraft programmed to track Galactus, which took them back into the Black Galaxy where they’d previously encountered Ego — arriving at the scene just in time for their ship to be torn apart by the awesome cosmic forces being wielded by the two combatants. My first Jack Kirby photo collage! The artist had of course been including such pieces in his work since 1964, but I, still a relative Marvel newbie, had never seen anything like this before in a comic book — or anywhere else, for that matter — and I was wowed. The mysterious ship approaching the two unconscious comrades belongs to the Wanderers — a band of spacefaring nomads who had introduced themselves to readers in the previous issue as “the first of Galactus’ victims! …for untold ages we have wandered through space, seeking our moment of… revenge! 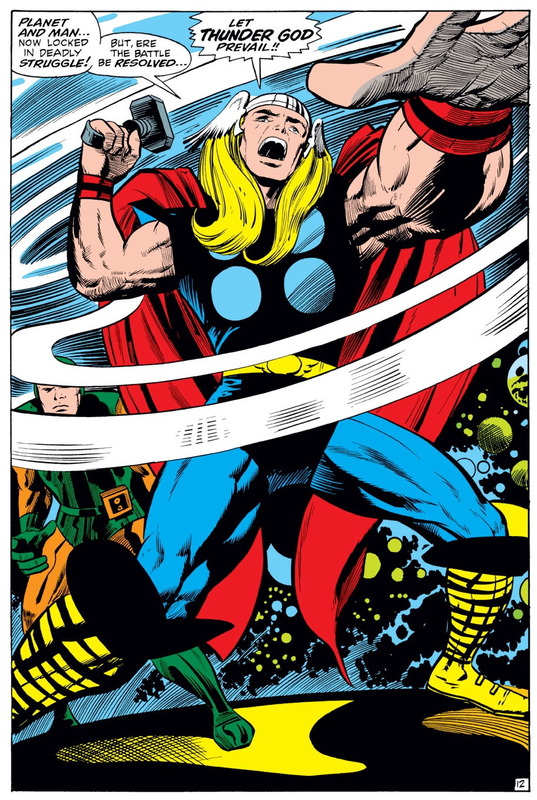 !” (In his introduction to Marvel Masterworks – Thor, Vol. 7, comics art historian Arlen Schumer observes that the Wanderers can easily be seen “as wandering Jews in a cosmic diaspora [minus the revenge]” — an identification likely to have been intentional on the part of one or both of the book’s creators, who were Jewish). And with those words, the story ends (or at least appears to; but more on that anon). Hearkening back to the notion of the Wanderers as a metaphor for the Jewish people, this last scene strikes a markedly Biblical note, with Ego in the dual roles of both the Promised Land and Yahweh. My own personal taste in Ego stories runs more to Ultimates 2 (2017) #8, in which Ego joins the Eternity Watch, a team of cosmic good-guys under the leadership of none other than Galactus himself (in his sadly temporary role as “the Lifebringer”). 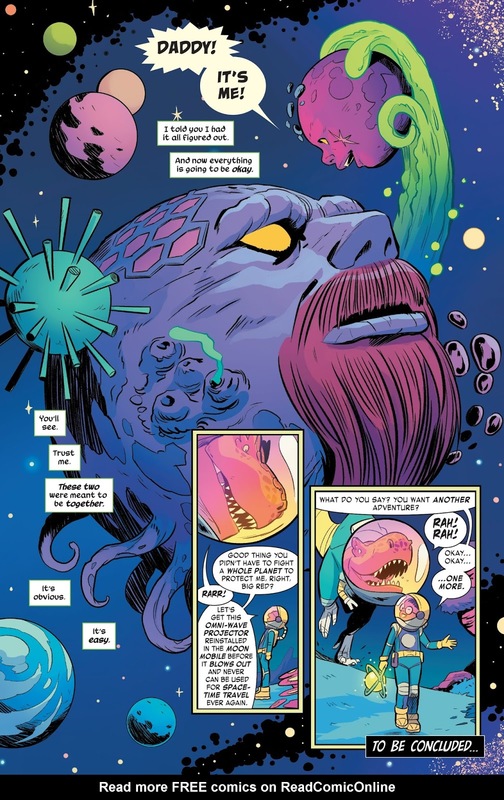 Or, even better, the story that recently ran in Moon Girl and Devil Dinosaur #19 – #23, in which the titular heroes reconcile the Living Planet with his long-estranged daughter, Ilia the Living Moon, whose orbit has fated her to be facing away from her father for untold millennia. Now that’s what I call an Ego story, folks. 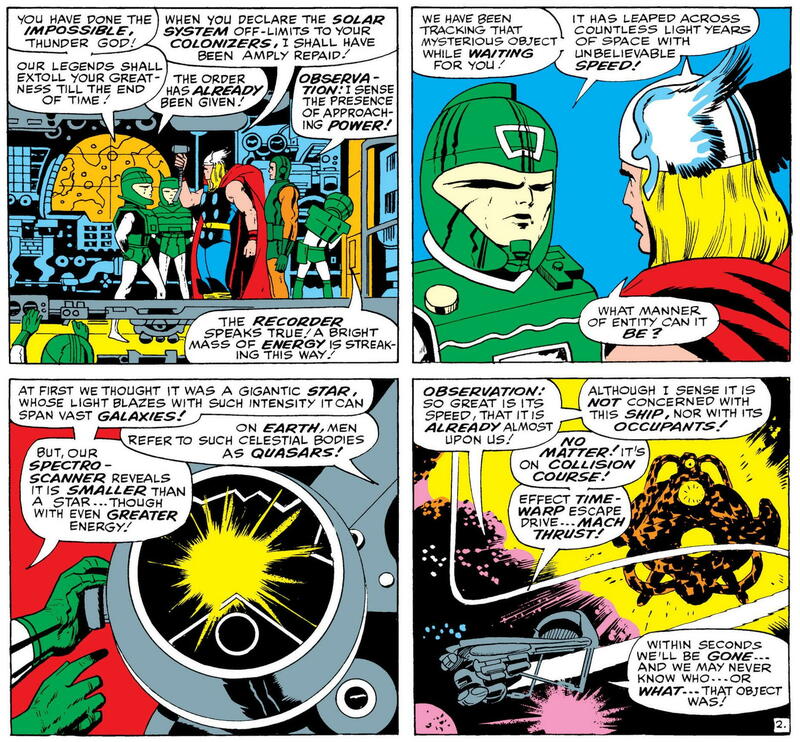 Yes, in spite of Thor’s seemingly quite thorough (if only temporary) defeat of the Big G in #161, Lee and Kirby weren’t quite done with the Devourer of Worlds in the pages of Thor just yet. Remember, they’d now established the idea that the very existence of Galactus was a threat to all living beings throughout the universe, including Asgard. So it stands to reason that not only Thor, but his All-Father Odin, wouldn’t be able to let matters rest where they lay at the end of “Shall a God Prevail?” And thus, in Thor #162 (which, alas, I didn’t buy off the stands, for whatever reason), Odin uses his Power Scepter to reveal a vision of Galactus’ earliest days to Thor and his pals, the Warriors Three. But even that wasn’t the end. 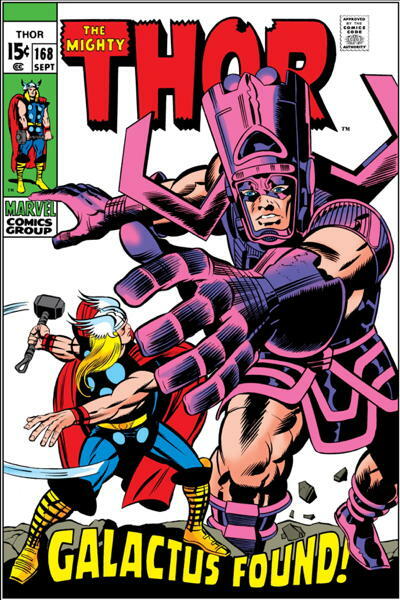 The story told in Thor #162 really only scratched the surface of the planet-eater’s secret origins, and the series, after taking a couple of detours, would ultimately return to Galactus some months later. 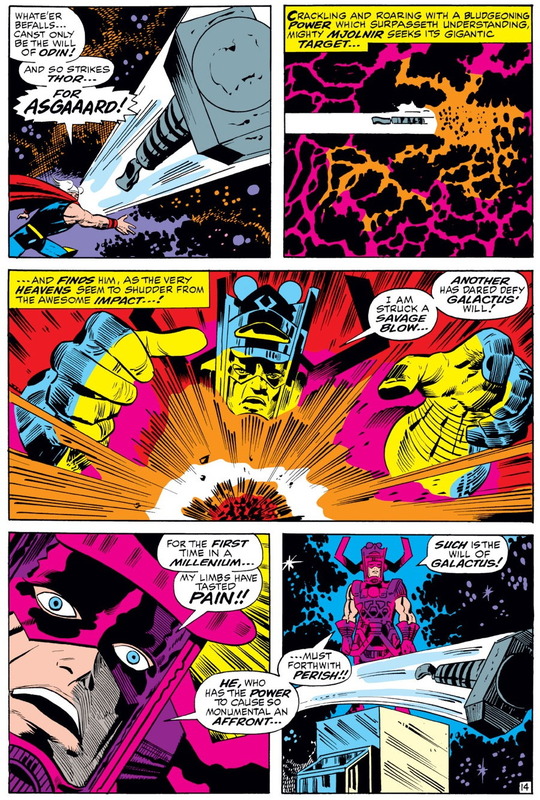 In Thor #168 and #169, readers would not only see the God of Thunder confront Galactus once again, but would also at long last get the full story of how the fearsome cosmic entity came to be (or, at least, the full story as it was known in 1969). But since I did buy and read those issues, the discussion of their revelations will have to wait until the blog gets around to their fiftieth anniversaries, sometime next summer. I do hope you’ll come back then. 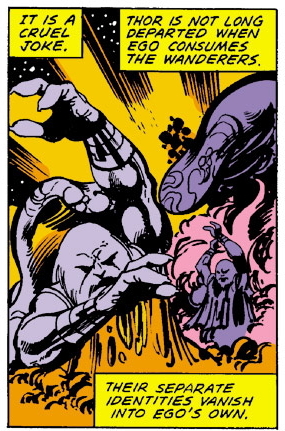 *For the record, Byrne’s retcon was itself further retconned in The Official Handbook of the Marvel Universe, Deluxe Edition #4, which established that prior to Ego’s devouring the Wanderers, he’d been driven mad by having a sample of his “tissue” removed from his surface. 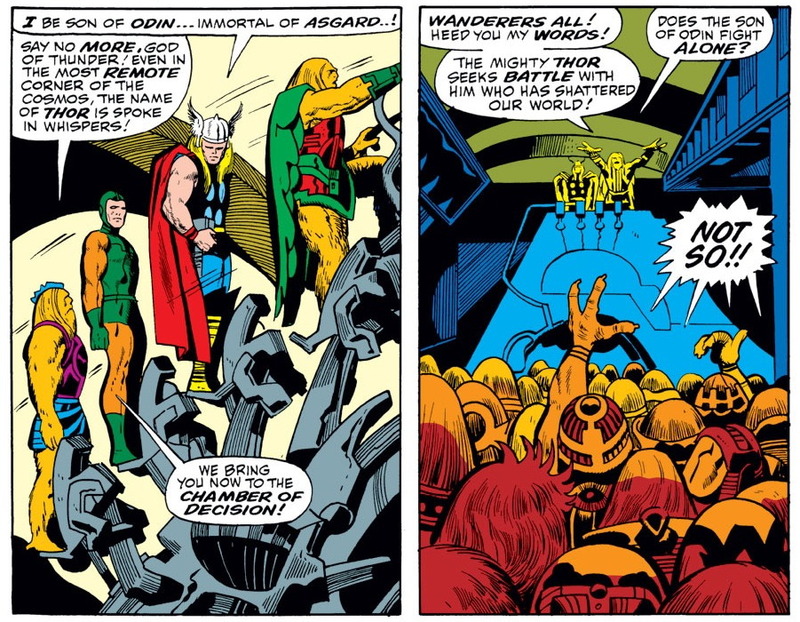 That somewhat ameliorated Byrne’s upending of the Lee-Kirby characterization of the Living Planet in Thor #161, by re-establishing that his invitation to the Wanderers was a genuine one; but the Wanderers themselves are still dead, of course. And like I said before, that’s a bummer. Great write-up! I’ve only read a handful of the Thor stories by Kirby & Lee, but #161 is one of them. Back in the year 2000 there was a big Marvel crossover “Maximum Security,” and Ego showed up in it. 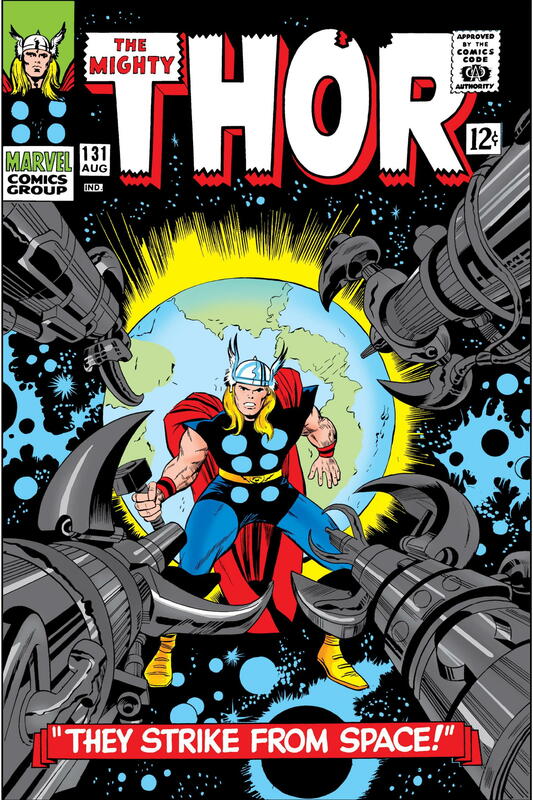 Marvel used this as the perfect justification to release a special (https://www.comics.org/issue/239960/) that reprinted Thor #s 133, 160 and 161. I bought it, and really enjoyed the stories. 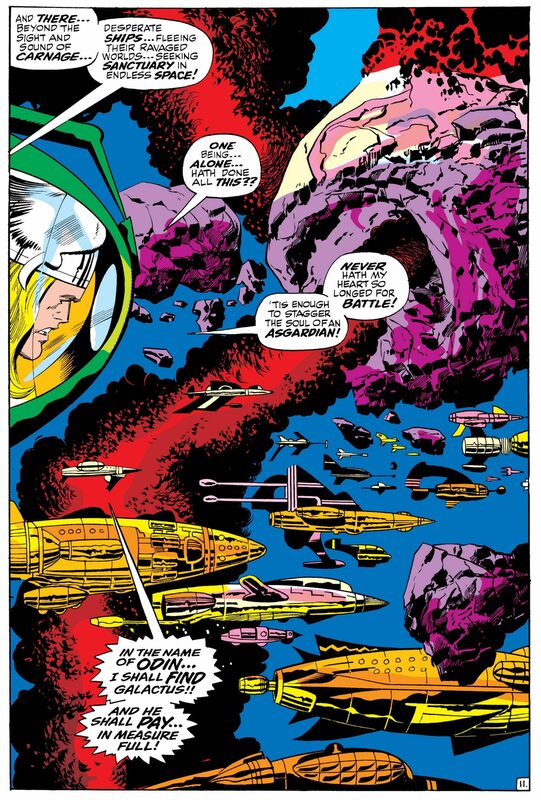 Kirby had such an incredible imagination, as those issues amply demonstrated. In regards to Ego, I guess he is one of those characters who can easily be adaptable to be a hero, a villain, or something in-between. I mean, he IS a totally alien life form, so his morality, his viewpoints, are going to be very different from anything resembling human beings. In that respect he is a lot like Galactus. I agree, it was unfortunate that Byrne turned Ego into a mass murderer (for someone who claims to revere Lee & Kirby, and who said he strove to want to adhere to the intentions of the original creators of characters, Byrne offered up more than a few destructive retcons during his work at Marvel) but at least in subsequent appearances other writers have shifted back towards a less villainous portrayal, instead showing Ego as somewhat amoral or alien. I marvel at how similar our comic book reading experiences have been. For me this Galactus segment of Thor stories was also my first time buying his mag. I of course went back and read many issues that came before at a later date. 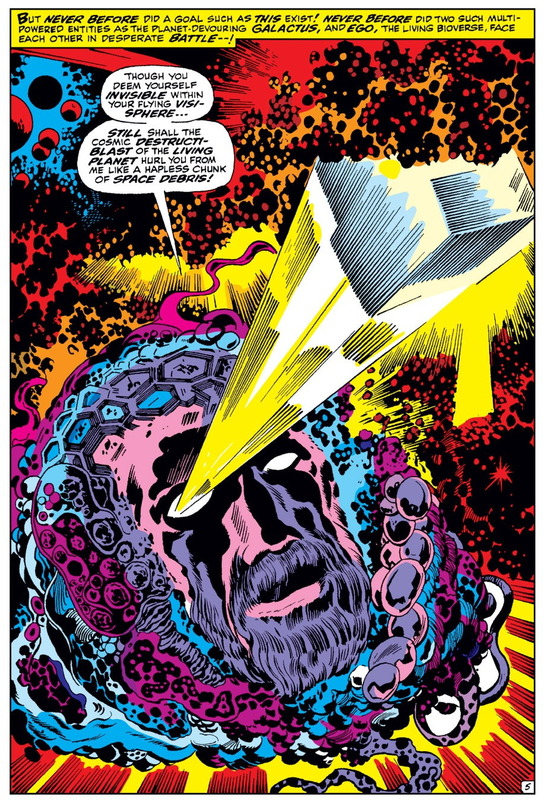 Anyway it really was just awe inspiring to see Kirby’s work, at the peak of his powers, in my opinion here. 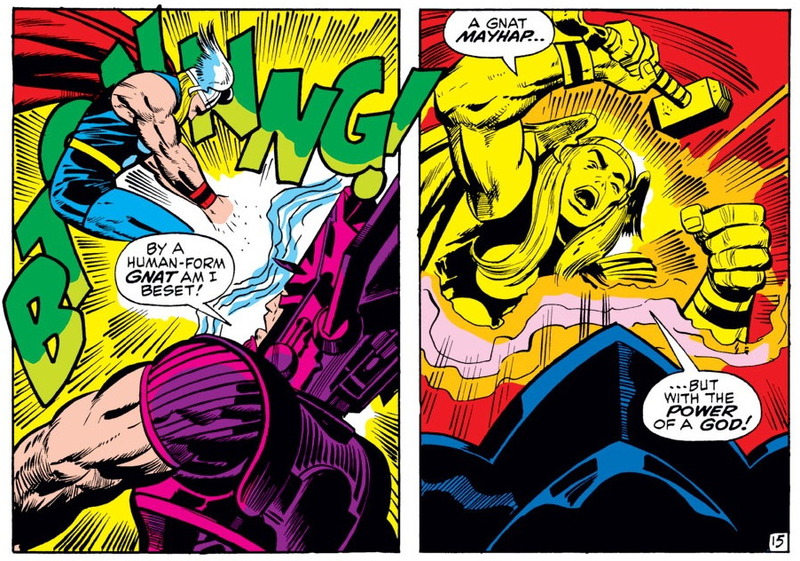 Lee grandiose wordplay springing forth, especially, from Thor’s mouth was well appreciated also. I always say Lee never gets enough credit for the compact, stylized, very consistent vernacular his characters use. Compare it to later writers versions and well…their really is no comparison. Joe, I agree that Stan Lee’s contribution deserves more credit for the success of his collaborations with Jack Kirby than some fans will ever give it. Even if Kirby was 100% responsible for the ideas, characters, and plotting of these stories (and I don’t think that anyone can truly say with certainty that he was), they wouldn’t be as good as they are without Lee’s words.